Thanksgiving is a time to give thanks for those that we love... and has plenty of opportunities for an "oops!" occasion. Just in time for the cranberry sauce and pumpkin pie, these 100% premium gauze cloth diapers from Gerber will soon be your best friends! Ultra absorbant yet stylish, these will look good on mom, dad AND baby! As an added bonus, the minky leaf applique is so soft you won't believe it. It receives "oohs" and "aaahs" from everyone who touches it! 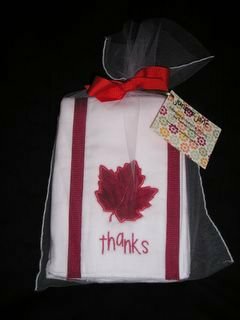 Packaged in a sweet tulle bag tied with a grosgrain ribbon, this set of two "oops" cloths is perfect for gift giving, so grab a set for yourself and everyone in your play group!